Sloppy Joe Cauliflower Rice is a welcome bun-less version of a childhood classic. 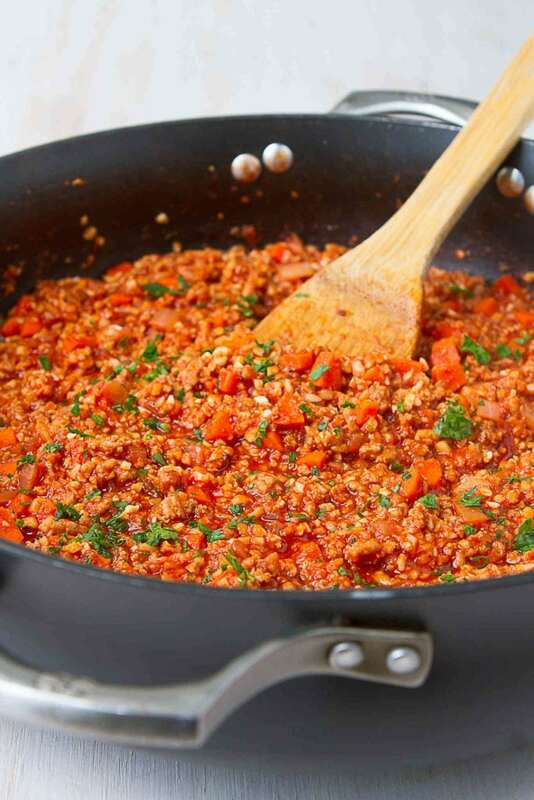 While I can’t claim that this is a low carb recipe, it’s certainly a great option if you’re looking to lower the carbs from your tried-and-true Sloppy Joe recipe. Cauliflower rice recipes are the way to go when you want to add more veggies and cut down on pasta, tortillas, regular rice and bread. Sloppy Joes weren’t something that my mum served when I was growing up, but there’s a good chance I ate my weight in them at various summer camps throughout the years. Admittedly, I don’t make them very often myself these days, but this cauliflower rice version is going to change that. Opt for a lower fat meat, such as ground turkey or extra lean ground beef. Many Sloppy Joe recipes include a large amount of ketchup, brown sugar and/or barbecue sauce. Instead I opted for tomato sauce sweetened with some barbecue sauce and a touch of agave nectar (or honey). Add some extra sweetness with diced carrots. Natural sugars are always a good way to go! You could eliminate the bread or opt for a whole wheat bun. 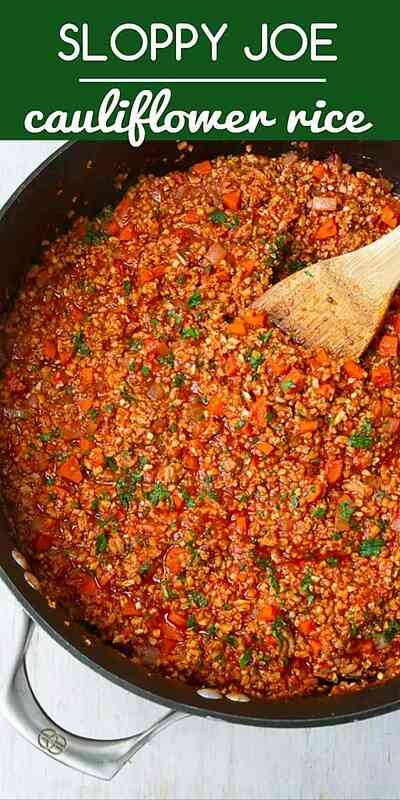 My kids love to wrap their hands around a bun packed with this Sloppy Joe mixture and choosing a fiber-packed bun to serve it on is a way to make things healthier. 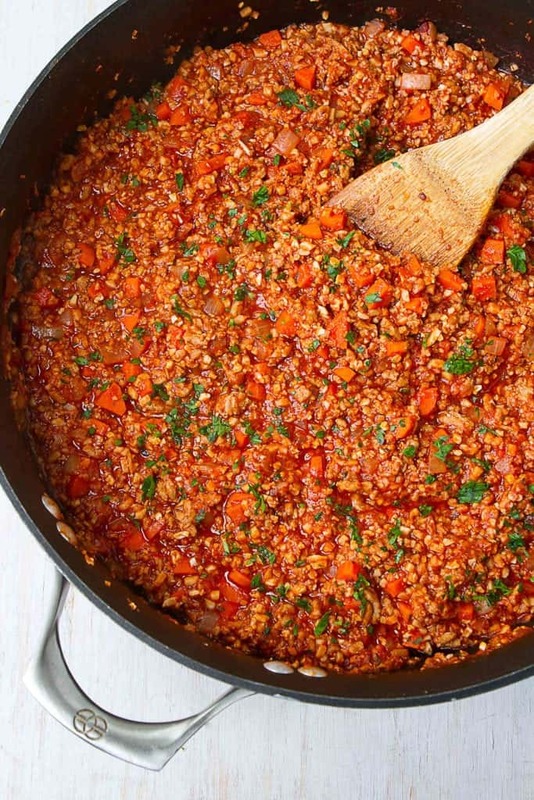 If you prefer to make this meatless, substitute lentils for the ground turkey. They’re packed with protein and have a meaty texture. Aromatics: Onion, carrots and garlic. Herbs & spices: Dried oregano and thyme, and red pepper flakes do the trick. Plus, don’t forget to season with salt and pepper. Ground turkey: I used lean (93%) rather than 99% lean because I prefer the flavor and moisture. Sauce ingredients: Canned tomato sauce, barbecue sauce (your favorite kind or homemade), tomato paste, Worcestershire (for the umami factor) and honey/agave nectar. Cauliflower rice: I buy the bags of fresh cauliflower rice at Trader Joe’s, but frozen would also work. Alternatively, grate cauliflower florets on a box grater. Heat 1 teaspoon olive oil in a large nonstick skillet set over medium heat. Add the carrots and saute until starting to soften, about 3 minutes. Pour in an additional teaspoon of olive oil. Add the onion, thyme and oregano and saute until the onions are tender, 4 to 5 minutes. Add the garlic and saute for an additional 30 seconds. Transfer the mixture to a bowl. Turn the heat to medium-high. Lightly coat the skillet with cooking spray, then add the ground turkey. Season with salt, pepper and crushed red pepper flakes. Cook, breaking up the turkey with a wooden spoon, until the turkey is cooked through. Drain any liquid. 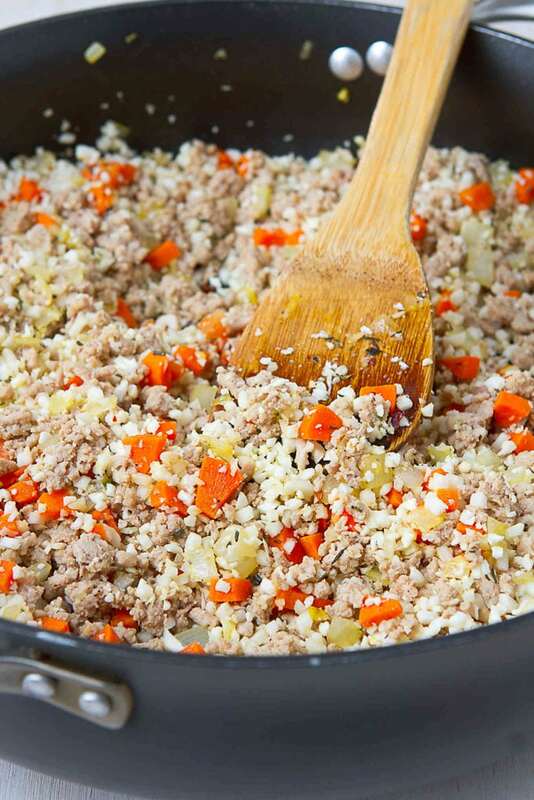 Return the vegetable mixture to the skillet, along with the cauliflower rice. Stir in the tomato sauce, barbecue sauce, tomato paste, Worcestershire sauce and honey. Bring to a boil, then simmer until the cauliflower rice is tender, stirring occasionally, 5 to 6 minutes. Stir in the parsley. Serve.